The secret to meltingly tender on the inside, crisp on the outside Greek potatoes can be elusive. The flavor is almost right with roasting, but the soft fluffy interiors tend to wind up a no-go. Parboiling the potatoes before roasting yields the right texture, but that extra step can be a hassle. 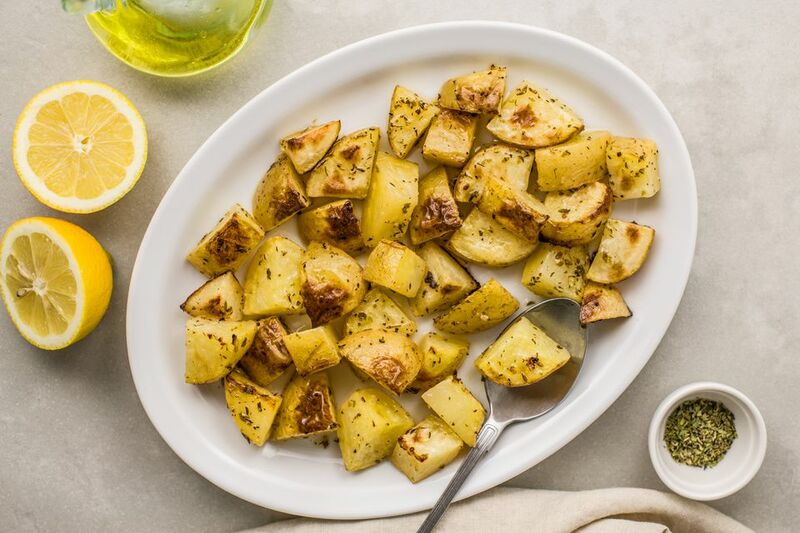 But adding water to the roasting pan -- along with a generous amount of olive oil, lemon juice, and spices -- proves the trick to easy -- and delicious -- potatoes. Place the potatoes in a single layer in a 9- x 13- x 2-inch baking dish. In a small bowl, whisk together the lemon juice, garlic, olive oil, water, and oregano. Season to taste with salt and pepper. Pour the mixture over the potatoes and toss to coat. Cover the pan with foil and bake in the preheated oven for 25 minutes. Pull the pan from the oven. Raise the heat to 425 F. Carefully remove the foil (be careful, as the steam can burn). Turn the potatoes with a spoon. Return the pan to the oven and roast for 20 to 25 minutes more, turning occasionally, or until the potatoes are tender on the inside, and crisp and browned on the outside. Serve these potatoes with a Mediterranean-inspired meal of grilled fish marinated in a smoky dressing and topped with tzatziki, a delicious cucumber yogurt sauce. Start with several mezze: think freshly baked pita bread with dips like homemade Hummus, Baba Ghanoush, and Roasted Fairy Tale Eggplants with Mint and Feta. To go with the meal, offer a Classic Greek Salad With Lemon Garlic Dressing, or riff on tradition with a Romaine Salad with Sun-Dried Tomatoes, Pecans, and Feta Cheese. Steamed broccoli or asparagus would be great sides, as well. For dessert, serve walnut or pistachio baklava and strong coffee. Prefer a meat menu? The lemony potatoes are a natural complement to the citrus notes in Persian Roast Chicken. Take advantage of the oven's heat while the potatoes are roasting, and slide in a pan of zucchini, eggplant, and red peppers to roast at the same time. Serve with baby spinach, treated to a quick saute with olive oil and garlic.